This week I hit my first major set-back, and it was a disheartening yet learning experience. Working in Zamrudpur, a village in the heart of Delhi, with its many caste and cultural nuances, is the first time I had to work in such a capacity on ground, even in a place I call home, and I’m learning that its far trickier to navigate a socio-political landscape that the physical one. 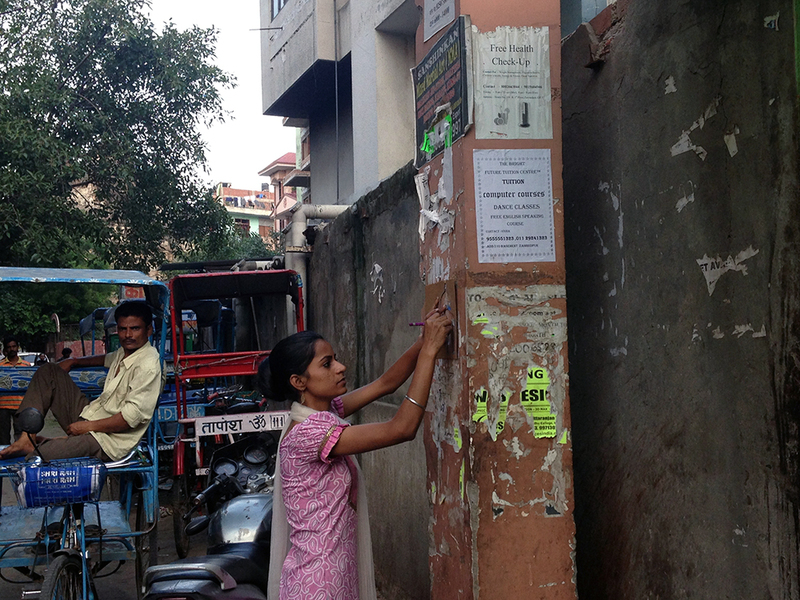 In India, especially in small neighborhoods, open markets or communities, close knit units and narrow streets, force most of the movement to be pedestrian. Here, distance measurement and way guidance gets simplified beyond actual dimensions and the human body becomes an important tool itself. Distance is most often measured in steps (‘kadam’ literally translating to feet) and directions would be given in the form of “take the first left, and about 30 steps from there is my house” or “the shops are tucked away in the alley barely 10 steps from the temple entrance”. 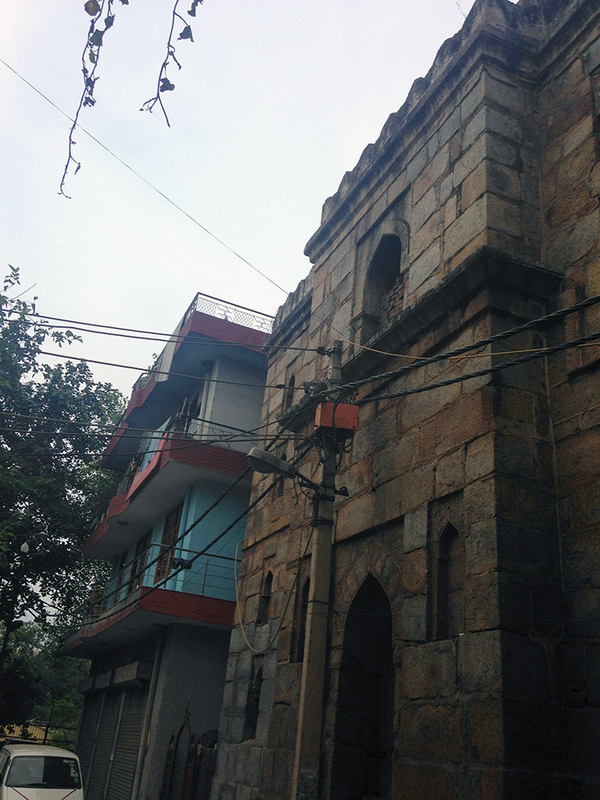 The greater Delhi city has existed since the mythological period of the Mahabharata and over time, its many rulers have left marks of their rein in the form of forts, walls, tombs, gateways, mosques and pavilion. Currently there exist over 300 such structures, ranging from the Sultan Ghari tomb, the oldest tomb in India built in 1231 to the Qila-i-Mubarak (Red fort) built in mid 1600’s. When we realize that this is just one city in a country the size of India, logistically, it has been near impossible for the concerned bodies, the Archaeological Society of India (ASI) and INTACH to catalogue or maintain each and every one of such structures. Their current conditions range from those incorporated to UNESCO World Heritage site and well maintained, to those semi protected by fences, to many nameless remnants scattered around. 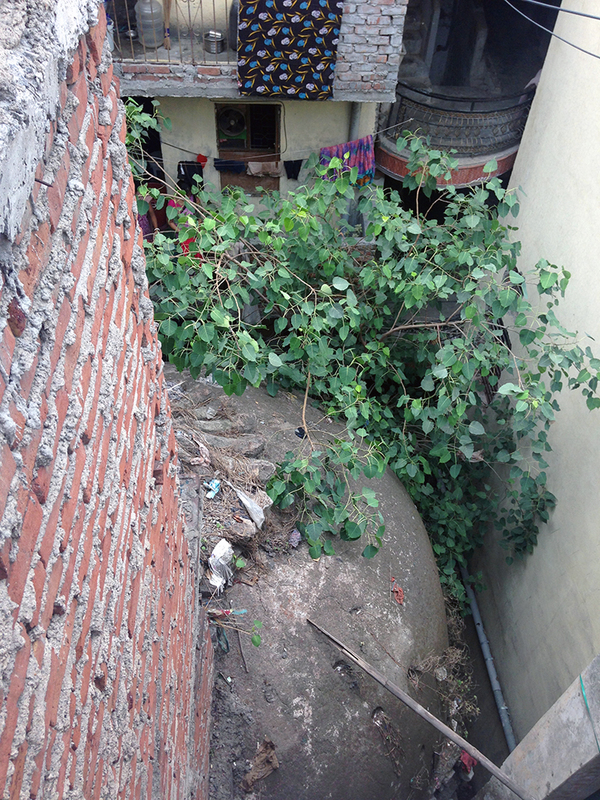 Though the jurisdiction ruling states that no constructions can take place within 200 meters of any historical monument, it is often overruled either by illegal encroachment or by certain loopholes in the city byelaws. 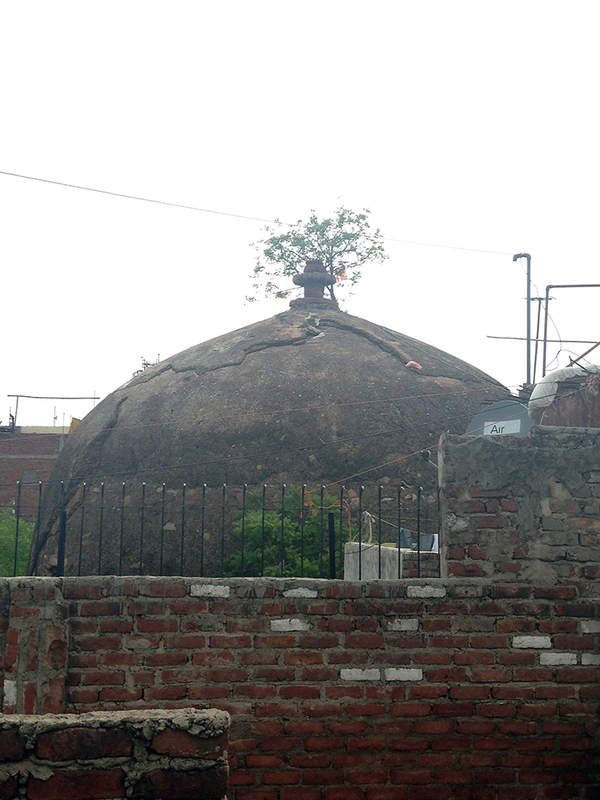 Zamrudpur is home to seven 14th century tombs located throughout this small community. During the past two weeks I’ve been hunting the archives of the ASI and INTACH to find more information about them. Unfortunately there’s no historical record of these tombs, the only mention being that of a Maulvi Zafar Hasan in a record of the city’s historical monuments in the first decade of the 20th century, who also attributes them to being of unknown origin. Owning to the village’s status as a lal dora urban village, there were some byelaws that it got exempted from and many that offered grey zones of interpretation leading to encroachments. In its growth and expansion in the heart of prime real estate of the city, its buildings and structures grew such that they’ve almost completely engulfed these historical monuments. 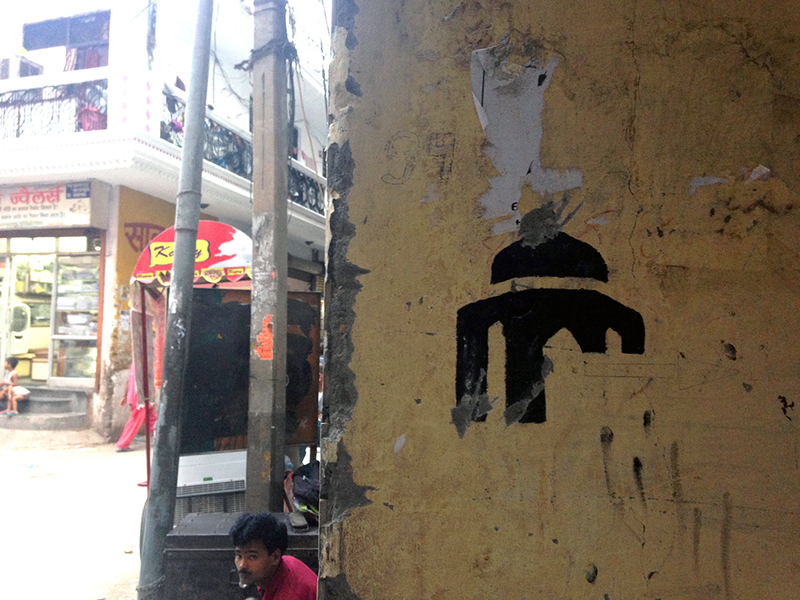 Buildings have sprung up next to, around, and through these tombs, all but hiding them from plain sight. As an experiment in way finding, I wanted to try calling out the location of these tombs through the winding lanes of the community. The small size of the community and the nature of their presence mean that the tombs are 15-20 meters at most off any of the main streets in the neighborhood. 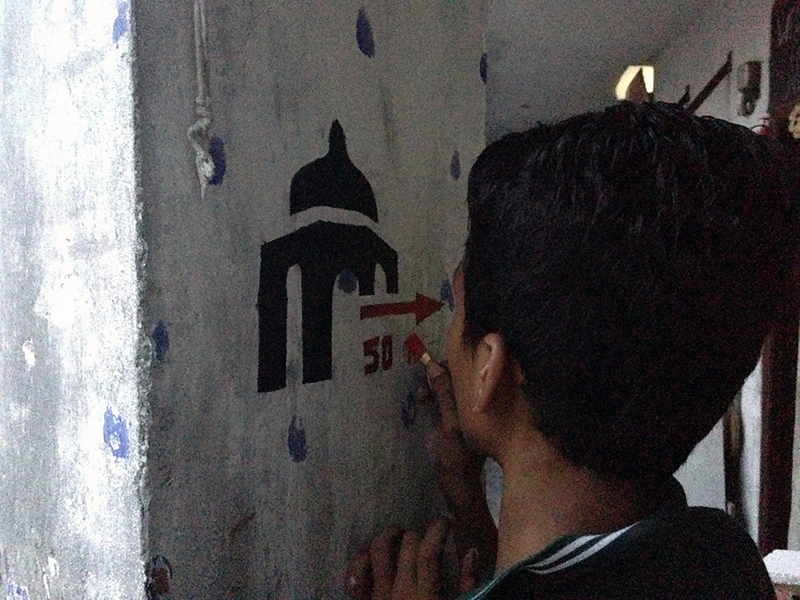 Expressing this in a layman’s anthropometric measurement understanding, we decided to paint markers exposing the nearby tombs and the number of “steps” that they were away from that spot. 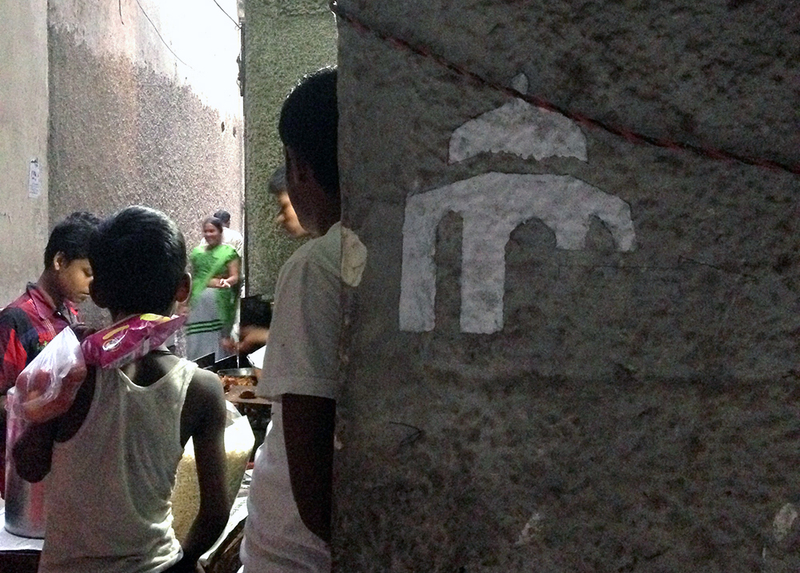 I created the stencils, with which some of the children started painting around the neighborhood. Unfortunately, we had barely started, when a few residents created a commotion regarding our project. 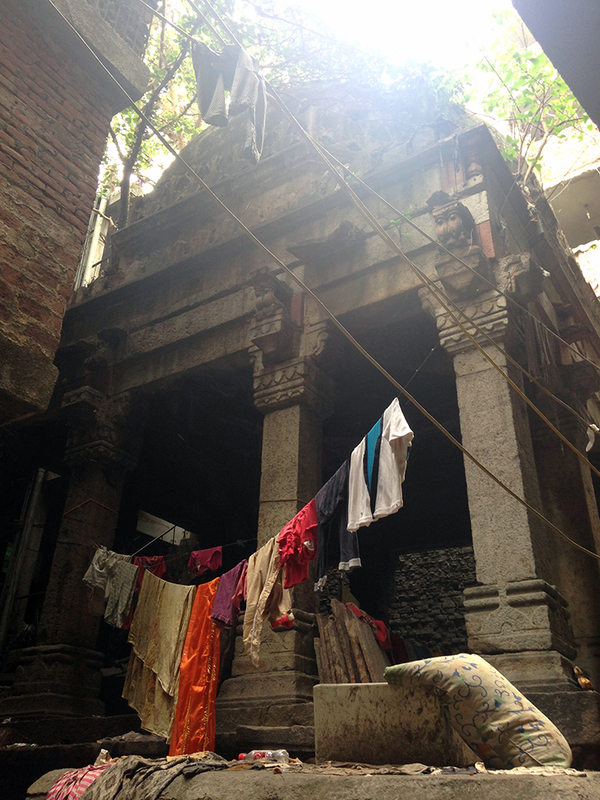 Many families have illegally encroached upon these tombs, using them as sheds for their cows, or extensions of their homes. 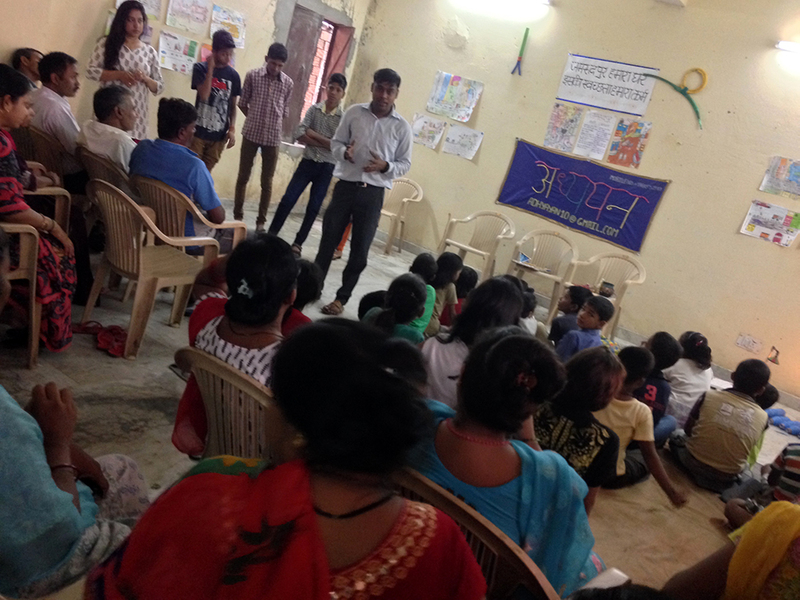 They got afraid that our project was trying to raise the issue in the municipal corporation’s eyes. 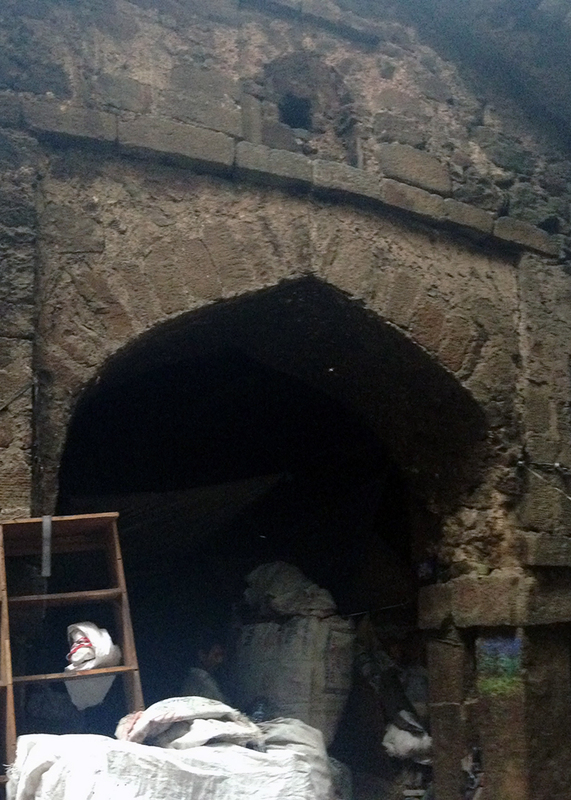 They’ve already been in court battles with the ASI for years regarding the status of these tombs. Despite our best efforts, and to try maintaining an acceptance of the NGO and our project in the community we had to abandon it mid way. My personal opinions on the situation and the legalities notwithstanding, (I am personally against historical monuments becoming passive, caged relics, with my own thesis project exploring the possibility of establishing a weekly market in the another monument complex in the city – Hauz Khas monument), we understood the futility of trying to press this strategy in such a short duration of my stay and instead try another avenue to explore way-finding in the community. Way-finding clues, which would be visually engaging and provoking, instead of being mere signage guiding movement. With only two weeks left, I’m nearing the end of my internship and fellowship experience at Massport. We had a meeting earlier this week with public policy officials from the Federal Aviation Administration. They flew in from D.C. to learn more about Massport’s Resiliency Program and the steps taken within the last six months to assess potential vulnerabilities, harden critical facilities, and establish Design Flood Elevations for existing buildings and new construction. We’re also in the early stages of branding Massport’s Resiliency Program. I drafted a few iterations of possible logos last month, after which we brought in the big guns–Massport’s Art Director and Senior Marketing Manager–to develop a final product. 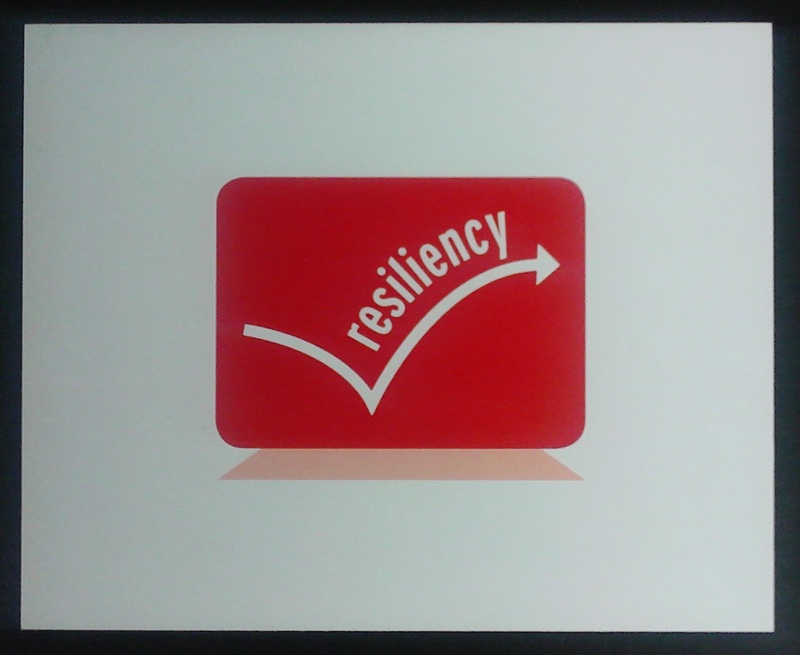 Three out of many of my early iterations for the resiliency logo design. A draft of what will soon be Massport’s Resiliency Logo, designed by Massport’s Art Director. I’ve been working on some new projects while waiting for authorization to take the Resiliency Webpages live. Our next Speaker Series event is in about two weeks and we’ve started putting together our upcoming Fall Series. I researched existing resilient building codes and drafted an opening to a set of new Resilient Design Guidelines, which a consultant is now working on. I’ve also been researching grants applicable to a potential Resiliency Task Force. The Task Force would be a collaboration between regional transportation and water-related agencies. This partnership would look at resilience with a wider lens and could lead to comprehensive, city-wide resilient transportation strategies. This is important because hardening Massport’s facilities to withstand a disaster won’t do much good if the city’s essential services are crippled, tunnels are flooded, and public transportation is inaccessible. Although within the context of resilience and public policy, I think that these projects reflect the work of a designer: making information accessible to a wider audience, working collaboratively, and getting people to the table to discuss solutions to shared concerns. Having recently finished the final interviews for the project– which featured conversations with a farmer and former TMI activist, a former mayor of Lancaster who served on the NRC Advisory Panel, and a former plant worker at TMI, I’m now working on visual development. The process of creating visuals to illustrate these narratives has also included field trips led by representatives from TMIA out and about in the neighboring areas of TMI. We’ve explored nearby towns like Goldsboro and walked up the river to get photo reference for the visuals. It’s been incredibly interesting to explore the area. I mean, it’s one thing to understand that a nuclear plant is operating nearby, but another thing to be able to see it from your backyard. 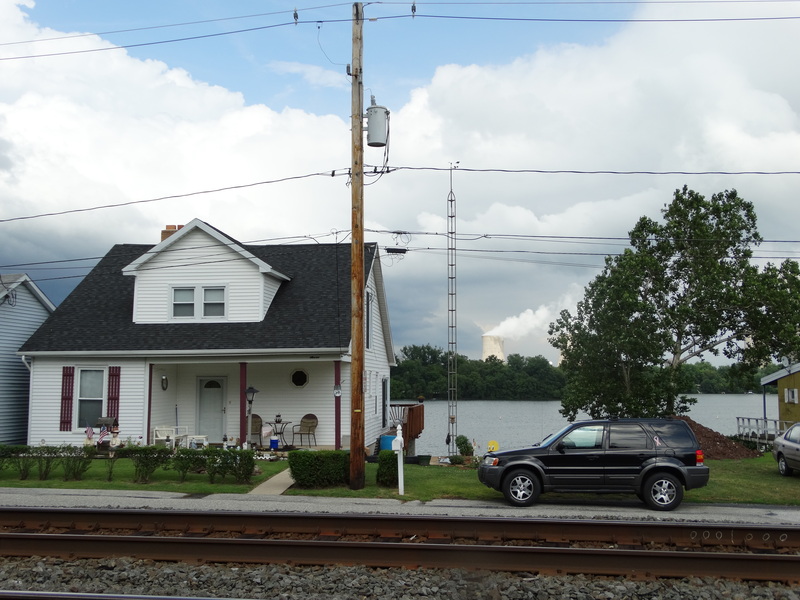 What was also notable was that this particular cross-section of town and river is a microcosm for the majority of PA: a nuclear plant on the left, a coal plant on the right and working-class suburbia in the middle. A house with an interesting view. A view of the coal plant down the river. Three Mile Island plant, Unit 1, billowing steam. An eerily serene sight. These field trips and follow-up meetings with interviewees have also imbued me with a new appreciation for the history of Pennsylvania. I guess I’d always viewed my state’s history in an itinerant way, largely missing the connections between an event and my current reality, especially a technological one like TMI. So, it’s been fascinating to gain an environmental history of PA, and also a narrative one from native Pennsylvanians. For example, I got the chance to interview a local farmer named Pattie Longenecker. She was kind enough to give me a tour of her farm and home, and spoke candidly about her experiences with TMI. From her dialect to her Mennonite quilts to her traditional home, she is the embodiment of Central PA. I’d never had the opportunity to meet someone who was so in touch with the land, or someone who could list her ancestors back ten generations. Mrs. Longenecker feeding her donkeys some carrots. Note her Amish hat, though she is not Amish but Dunker, another form of anabaptist faith. 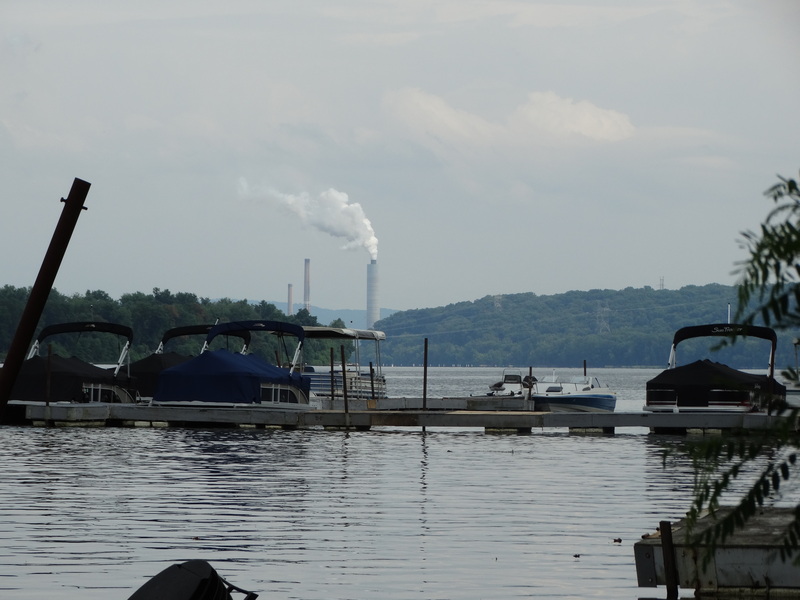 I grew up in Bainbridge, PA. And that’s about three miles south of Three Mile Island. [Our roots] are very deep in this area. Mine go back ten generations in a little five-mile radius. And we built this property out in the countryside where we raised two children. We were self-sufficient for many years, raising chickens, ducks, geese, sheep herd, all the crops we needed. We just have such an appreciation that developed over those early years. I think, as we get older, it’s an even deeper feeling that you appreciate the seasons and how nature has its role in each season – just how everything has to fit together. And when it doesn’t, you see what can go wrong. 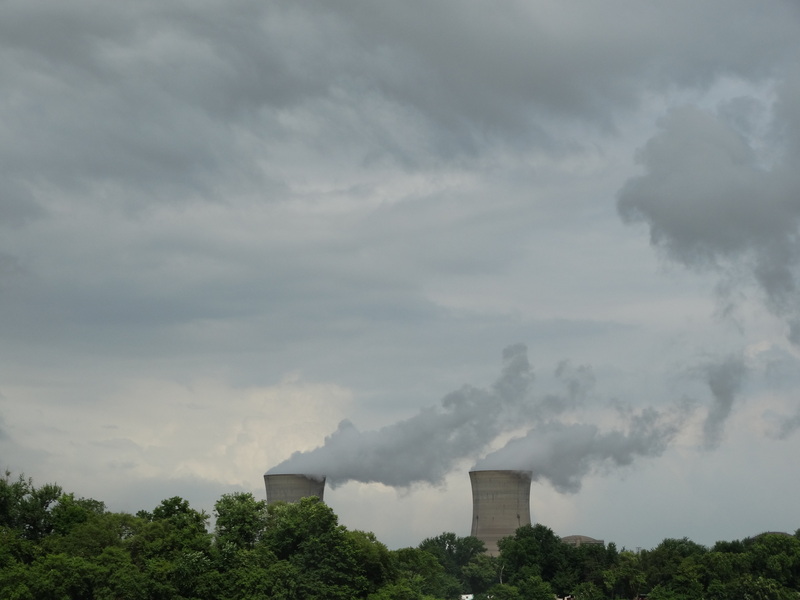 And when Three Mile Island happened, we felt strongly about that as an issue because of the fact that we were so in tune with our surroundings. It just seemed like such a negative in what we thought of as a very positive way of living. I feel this is an event in the life of this area that has affected many of us. And it will go on affecting us for generations. We have an island in the middle of the Susquehanna River in a flood plane on which my grandmother’s cousins grew the best melons in this whole area until they sold to the utility after a big flood. I think it was 1936 or ’38 or something. There, we already have a risk when you put something of this magnitude – when this was built, we had no clue what was being built in our river. When you traveled even to Europe, someone would wonder where you’re from. And where I used to always be so proud to say Lancaster County, Pennsylvania – some of the best farmland in the world – they would know you’re from Three Mile Island. And I felt: what a commentary to go from being known in such a positive vein worldwide – Lancaster County soil is some of the best in the whole world… and this [TMI] is what we were known for. It’s going back here to change these new chapters with a whole different commentary on the lives we would know from then on. Talking with Mrs. Longenecker helped me understand a new perspective– that many of the people involved with TMI were not troublemakers or agenda-ready politicos, but simple people who were looking out for their land and way of life. I’m looking forward to finishing up the visuals for these stories to be able to share them in their entirety. Following the scare and concern of the last couple weeks over the health of the hives, this week each of the three hives I have are bustling with activity. Early in the week I took a trip to Merrimack, NH to visit Hillside Apiaries run by Allen Lindahl. The hives are reaching a critical mass and thus is time to expand their condo by adding another hive body (box to hold frames). 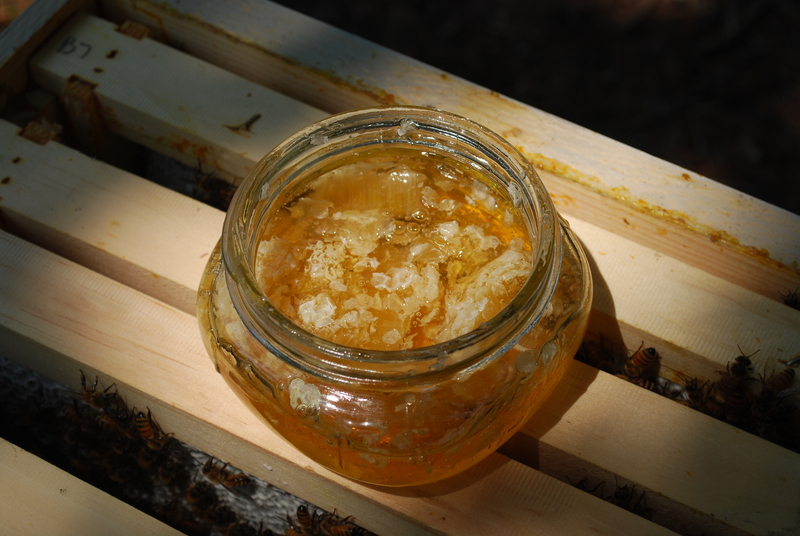 Allen is a charming New Hampshire man running a small beekeeping supply store from his home. He has 21 years of experience and thus a tremendous amount of knowledge. He is very friendly and encourages any beginning beekeepers to call him with questions: 603 429 0808 or Allen@hillsidebees.com. 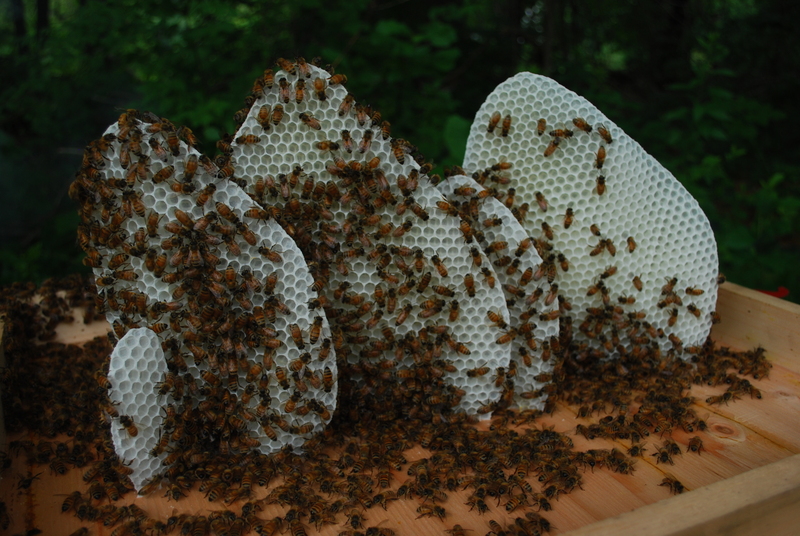 Natural comb production on the inner cover shows the necessity to provide more living space for the bees. 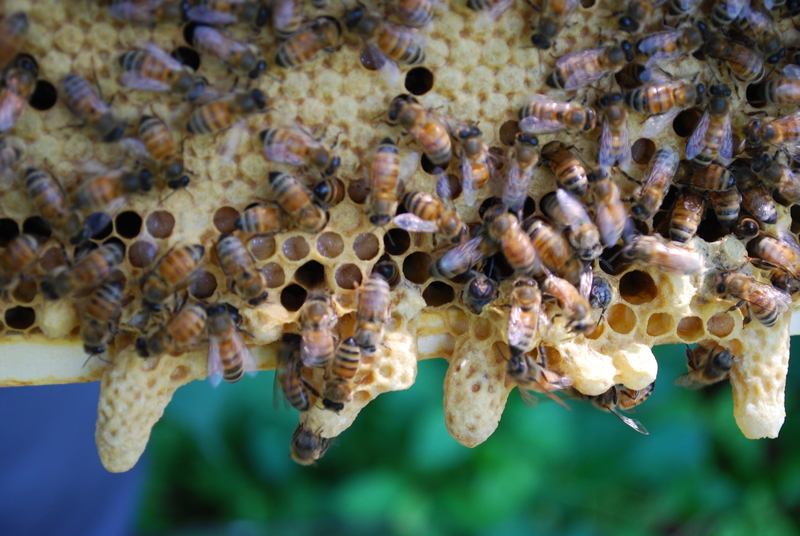 Worker bees secrete wax from a gland on the front side of their abdomen. A drop of wax is released from the body and hardens when it comes into contact with air. This wax is thin and resembles a fish scale. From the abdomen, the bee moves the wax with her legs passing it forward where she masticates it, mixing in saliva and softening it for use in construction. Above is a picture of a worker making comb. Today we saw the neighbor working in his garden and decided to bring him a little treat. The bees had a little feast when we opened the honey stores. While visiting with Kevin, the neighbor, we had a conversation about the use of pesticides on his Hibiscus plant that had been attacked by worms. 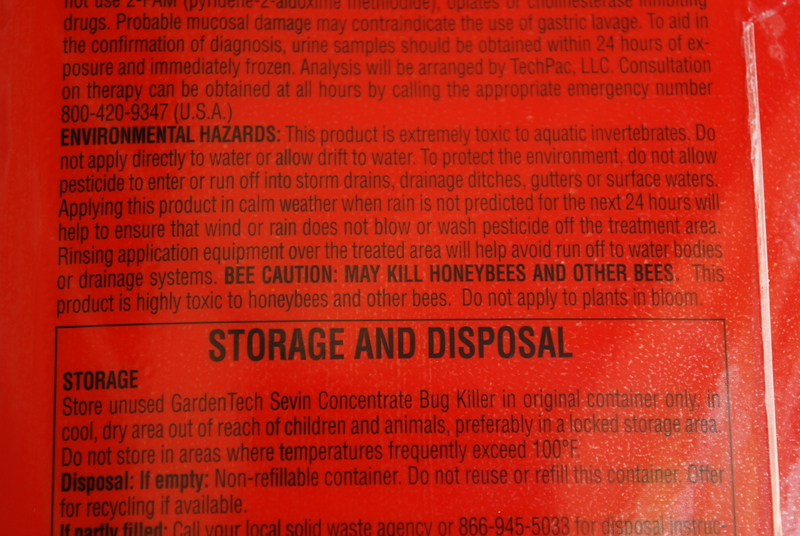 He said that it was his instinct to use a common pesticide from Home Depot to treat the plant but worried about the bees. He still had the product he was planning to use so we decided to check it out. Soak 5 hot peppers and 5 cloves of garlic in 1/4 cup of water for 30 minutes. Blend this mix into a paste and add 1 teaspoon of dish soap, 1/2 teaspoon of baking soda and 1/4 teaspoon of vegetable oil. 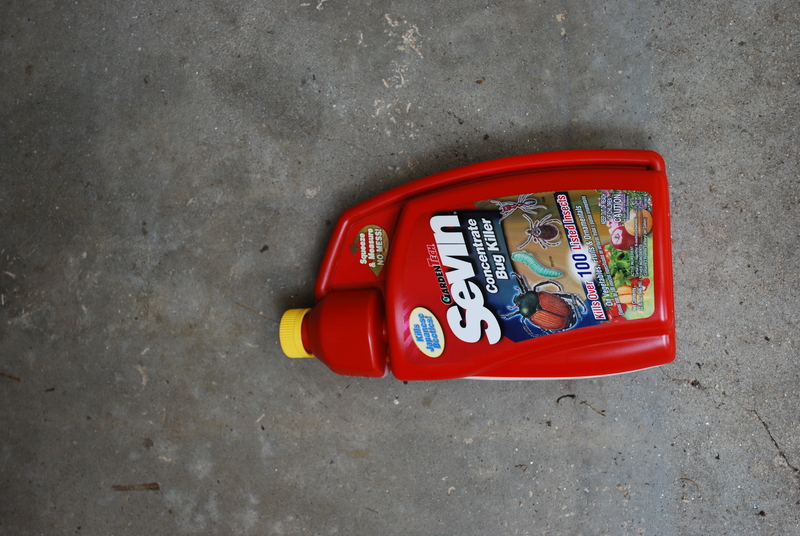 Blend together and combine with 1 quart of water. 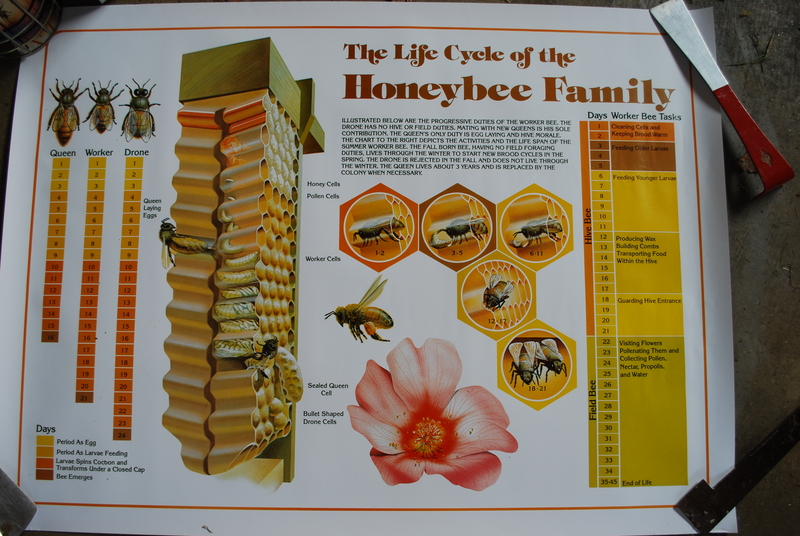 Also, found this great poster of the life of the honeybee at Hillside Apiaries. It clearly shows the different classes a worker bee will go through during its life as well as nicely illustrating the developmental stages of the queen, worker and drone from egg to emersion. Last week I ranted a little bit about how I still don’t know how to deal with the question “what are you doing this summer?” (even though I’m already going into Week 7 – oof). So I thought it would be worthwhile to write a bit about some things I have actually been doing. As you may remember, I’m working with the law firm DeLuca and Weizenbaum in their efforts to launch a new public interest law center in the state – the RI Center for Justice. In its beta year, the center will be focused on housing broadly defined. This could encompass landlord-tenant issues, evictions, code enforcement, discrimination, homeless rights, etc. This year, there have been several community meetings to start conversations about what housing issues could be addressed, and one of the areas that came up as a potential focus was utility shutoffs. As a design researcher embedded in the early stages of the law center’s formation, my big picture research questions include: 1) How do individuals currently deal with their particular housing issues? 2) What are people’s current points of housing-related interaction with the legal system? But in order to focus my activities in the short amount of time I have, I’ve been trying to learn as much as I can about the experience of energy insecurity. 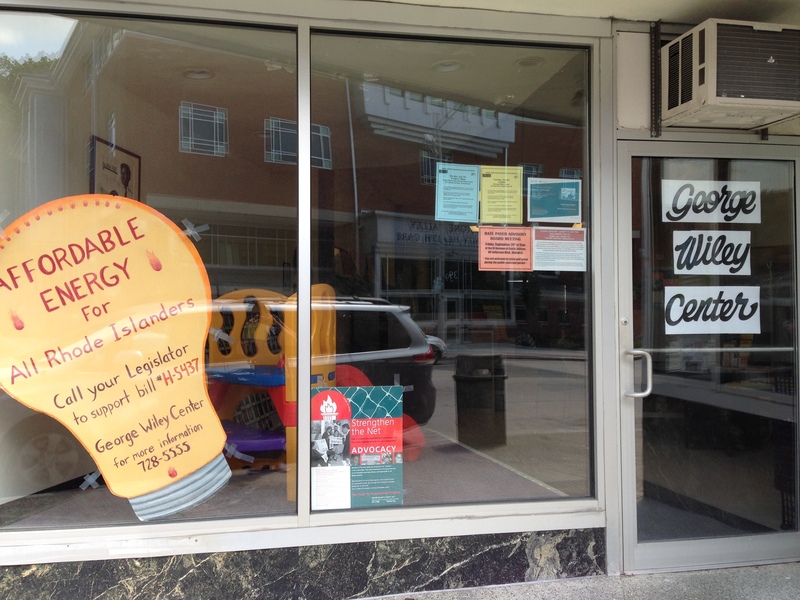 Though their core mission is organizing for policy change, the GWC in April began holding twice weekly “utility clinics” with a new consumer advocate from National Grid. When people call in with an urgent situation, they can now come meet with the National Grid representative face to face to try to work something out. 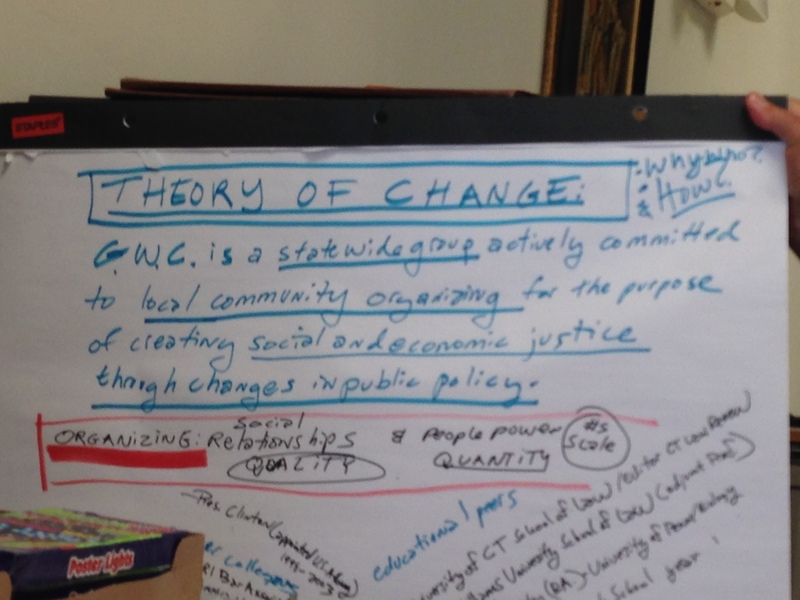 The George Wiley Center’s theory of change: GWC is a statewide group actively committed to local community organizing for the purpose of creating social and economic justice through changes in public policy. The folks at the GWC have been really accommodating in letting me observe the work that happens at the center. I’ve been sitting with Roxanne – the woman from National Grid – at the utility clinics, listening and watching during the clinic’s half hour appointments. I’ve also had some great conversations with the GWC staff and their community organizer, Camilo Vivieros, on topics ranging from utilities, the tension between direct service and policy change, and capturing people’s stories for advocacy. I’ve been trying to challenge myself to visualize what I’m observing and learning, so over the last week I’ve been working on creating a journey map to plot the experience someone goes through when their utilities are shut off. I’m hoping this will be a valuable tool for talking both with the GWC and the law center team. 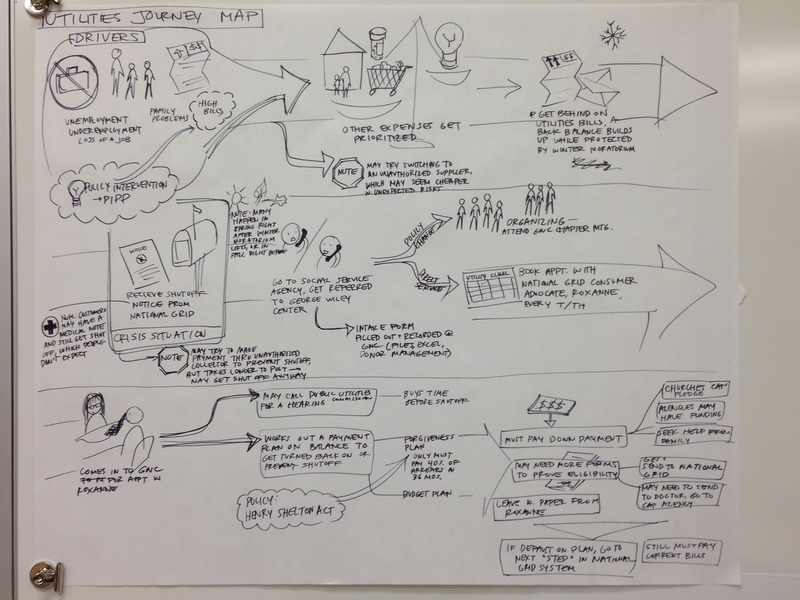 In making this journey map, I’ve thought through more questions and am sure there are things I’ve missing – but it’s a good step in starting to discuss people’s access points to services and where the law might fit in. This coming week, I will be going to interview a woman who recently contacted the GWC. After having her gas shut off for a few months, she’s now at risk for losing her Section 8 voucher. She needs legal help in her corner, but I really don’t know what will happen with her situation. It’s an incredible privilege to be invited into someone’s home…and I’m hoping that capturing and sharing her story will help the law center help others with similar situations in the future. This is a bit of what I have actually been doing – more to come soon. This Sunday we had the first of our bi-weekly community meetings. 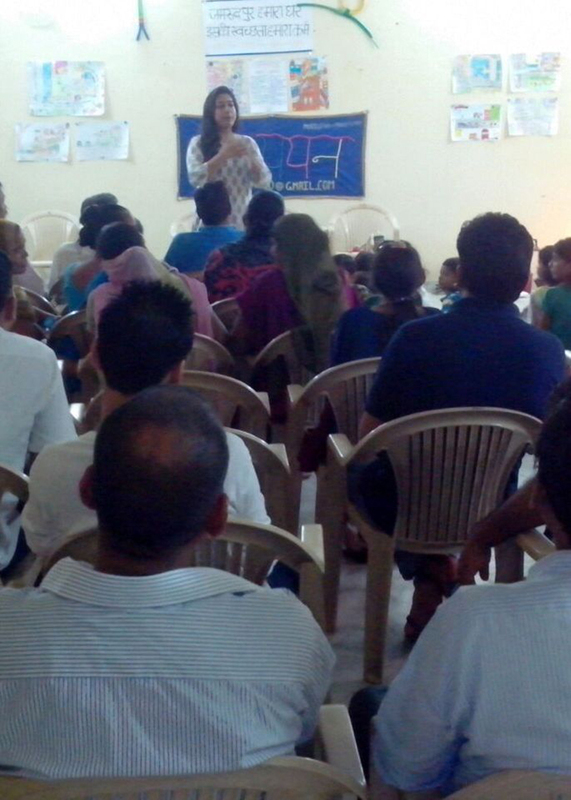 This was a chance for us at Adhyayan to interact with about seventy senior members of the community including community leaders, the local political representative and the parents of the students at Adhyayan. Though I had been exploring the neighborhood and talking to people on my own these past weeks, this allowed us all to collectively meet and communicate, as well as for us to show the adults some of the work the children had been working on and engage them in an experiment whose success lies in the active collaboration of the whole community and not just kids at Adhyayan. We have been lucky to secure space in the community hall Chaupal, which will serve as the venue of our meetings, screenings and exhibitions in the neighborhood. Through the meeting, we explained some of the goals of our project – making the neighborhood more accessible and safer for any outsider, from a guest to a potential customer and business, and thereby breaking some of current stereotypes and prejudices that Zamrudpur village faces. 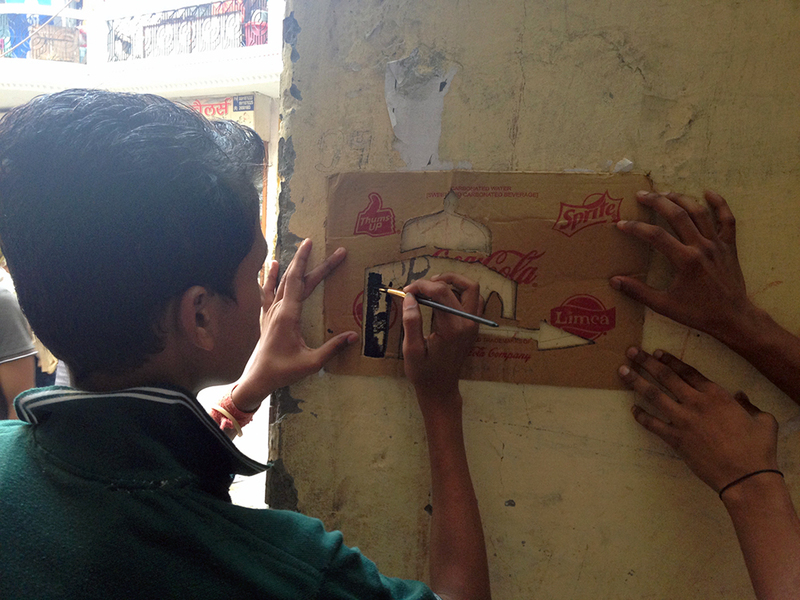 By introducing the adults to the initiative, we hope to involve them in the upcoming weeks’ work in which we’ll take to the streets – painting, installing and scattering graphic markers throughout the neighborhoods. Most importantly, the aim was to address the urgent and immediate issue of community ownership and neighborhood pride in the form of tackling the garbage and hygiene issues in the area. “We ourselves are the perpetrators and we ourselves have to live in the conditions that we create. Why is that we understand the importance of cleanliness and hygiene and thus take great pains to clean our homes, but don’t recognize the street outside as being the forecourt, the ‘aangan’ to the home.” Instead of us trying to preach about systematic cleanliness, we showed the children’s’ work where their capture of the everyday conditions from watching their own parents throw out trash to their choice in mapping the ways to their homes showed their astute observation and impact of the actions of their parents. Movement through street submerged in water because of clogged drains, health concerns brought from unhygienic conditions and the loss of potential business from neighborhood communities due to unfavorable conditions harms the residents themselves. Therefore addressing the issue has direct and immediate consequences on their own lives and livelihoods. The food and party afterwards was a good way to chat with some of the ladies who seem to have finally stopped eyeing me as a suspicious outsider and for the amazing kids to have an afternoon of fun. There’s nothing like samosas to get us Indians in a good mood! Though we received a positive response from the community, there wasn’t an impulse for active participation from the adults yet. I hope that in the coming weeks, once people start seeing the installations come up in the streets, that there will be a greater interest and engagement. I’m happy to finally report that last week was my first full week of work at the Collaboratory! On my first day, I successfully navigated the maze of buildings associated with the U.S. Department of State (DoS) in the Washington D.C. humidity and was officially sworn in as a Franklin Fellow. This was a pretty cool experience, as I took an oath to the U.S. Constitution itself alongside another Fellow. 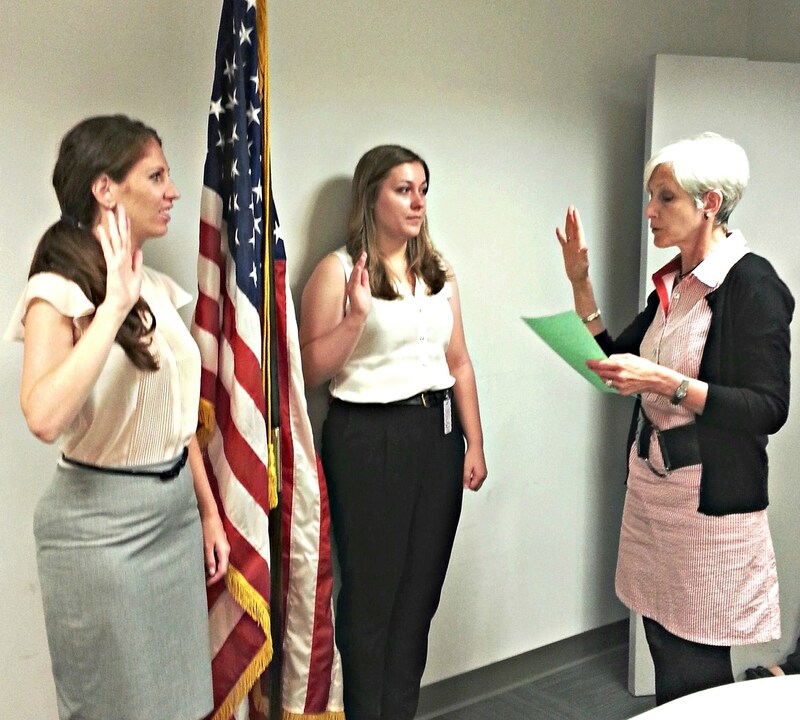 Here’s a nerdy picture of me (middle, trying not to mess up the words) by the American flag taking the oath. Three cheers for public service! My team at the Collaboratory surprised me by showing up en masse to my “onboarding,” which is DoS-speak for swearing in and first-day-of-work paperwork. They also decorated my cubicle (which I’m trying to treat as a studio space) and threw me a surprise welcome/birthday party at our daily team meeting. This, I’m learning, is par for the course at our shop, where we operate according to a people-first principle that is particularly prominent on team member birthdays. My time so far has largely been spent doing research and data-gathering, where I’m getting up to speed on the work and culture at the Collaboratory, the ECA Bureau, and DoS at large. I’m swimming in an alphabet soup of acronyms; for example, depending on the context, PD may mean Position Description, Professional Development, or Public Diplomacy. I’m getting to know my team and interviewing them individually to understand their experiences, goals, and portfolios as users working within the Collaboratory. I’ve begun consulting with a long list of other people working at DoS to understand their experiences and interactions with the Collaboratory as well. The Collaboratory can be a little difficult to understand at first, and that’s partly because it is iterating so quickly that its self-understanding is sometimes changing month to month. In November 2013, the Bureau of Educational and Cultural Affairs (ECA) announced the launch of the Collaboratory, a new shop that was to be focused on virtual exchanges. ECA runs the Department’s 150+ cultural and educational exchange programs for Americans and foreign nationals, of which one of the most famous is the Fulbright program. This is part of a larger mission of public diplomacy, where education diplomacy has been a major focus and strategy to reinforce mutual understanding across cultures. In this context, the Collaboratory quickly grew from a team dedicated to virtual exchanges—which use technology to augment in-person exchanges by connecting people virtually—to a team equally interested in collaborative techniques and innovative approaches to government. The Collaboratory also wanted to serve as a network, connecting people within ECA to one another, to other bureaus at DoS, to other government agencies, and to organizations outside government, like NGOs, tech companies, and higher education institutions. Today, we are active on all of those fronts, and continuing to grow and “rewire,” as my boss frequently says. 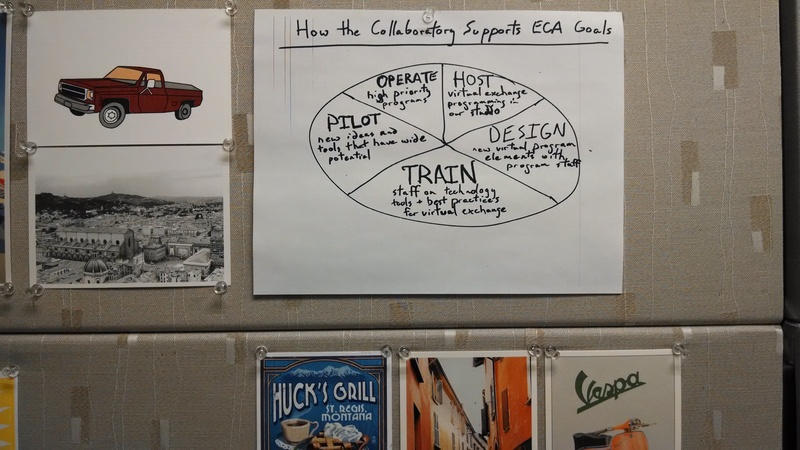 Prior to my onboarding, the Collaboratory team (of which I am now the sixth member) drew a chart to express their latest take on their mission within ECA. It’s in all of our workspaces (you can see it in mine below) and also in our studio, a former conference room built from big dreams, donated decor, and no budget. This is where we run virtual programs, hold meetings, and brainstorm new ideas on a variety of fronts. 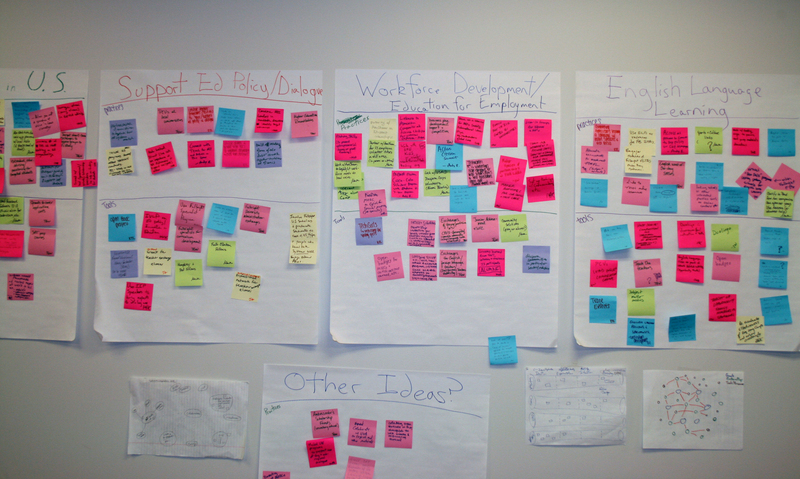 The post-its on the wall are crowd-sourced ideas for an Education Diplomacy Toolkit that will be sent to posts (embassies and consulates) overseas to help them build their education diplomacy initiatives. Over the coming weeks, I’m eager to begin compiling and sharing insights gained from my interviews with the Collaboratory team as we begin to think about refining our brand and visual identity. I’ll be jumping in on some ongoing projects and begin training on connective technologies for virtual exchanges. My quest for Creative Suite software will progress. I’ll also continue to accumulate design thinking resources—books, articles, videos, websites, etc—to share with my team and add to our cumulative reading list for our Tuesday reading period. I’m lucky in that my team is excited about design thinking and eager to know more. We are definitely the odd ducks in federal government, but hopefully not for long! The views expressed in this article are those of the author and do not necessarily represent the views of, and should not be attributed to, the U.S. Department of State. 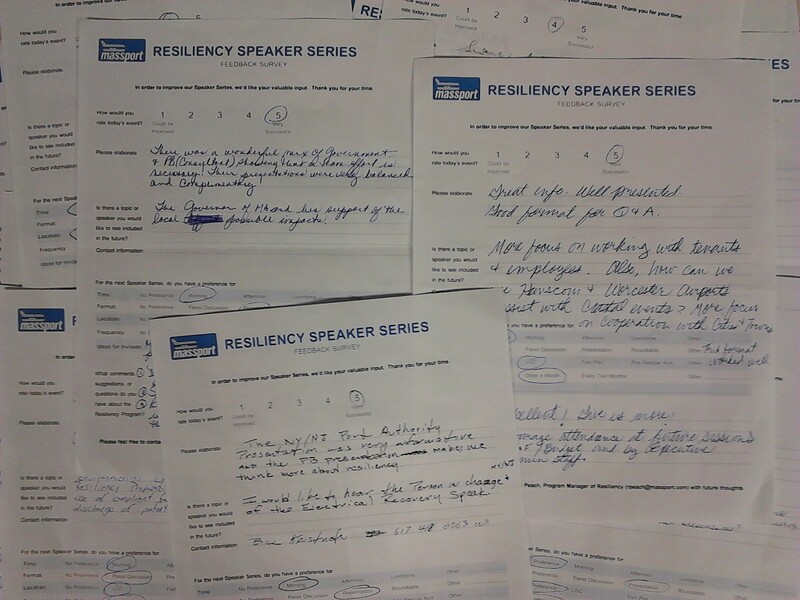 We kicked off our first Resiliency Speaker Series event on Monday. We had a great turnout with over 60 attendees. Susanne DesRoches (Assistant Chief, Resilience and Sustainability) came to speak from the Port Authority of New York and New Jersey along with John Boule (Vice President) from the engineering firm Parsons Brinckerhoff. The speakers gave engaging presentations and answered dozens of questions from the audience. The discussion ranged from the effects of Hurricane Sandy in New York and New Jersey to resilient strategies for Boston and Massport facilities. We heard about Sandy’s disruptions to New York’s PATH Transportation System and ongoing complications that include salt’s pervasive and corrosive effects. Over 30% of our audience completed Speaker Series Surveys, giving us some great feedback as well as an average success rating of 4.4 out of 5 for this first event. 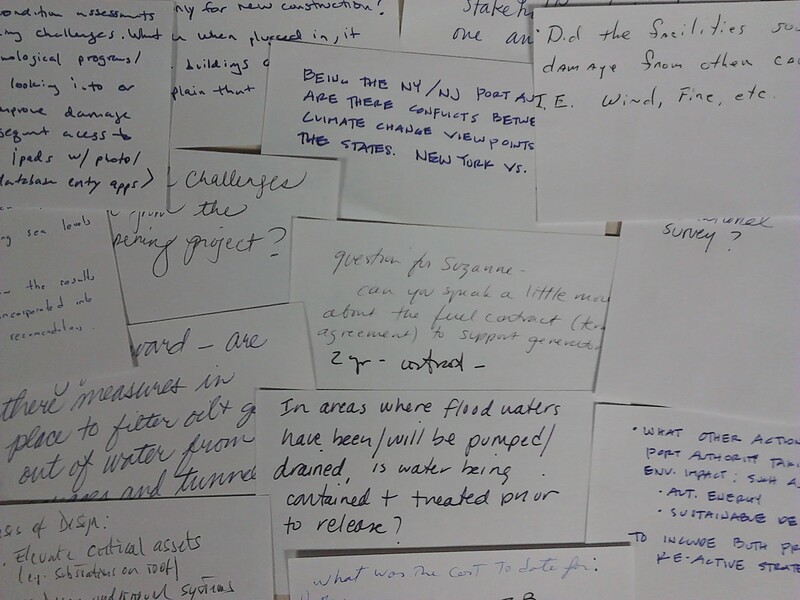 Questions filled out by the audience for our Q&A session. The event was a success, but it wouldn’t be an internship experience if it went off without a few bumps. The highlights included me barging into someone’s office while looking for a storage closet and accidentally leaving some of our guests languishing at the security desk before the event began. This was a problem because the doors, stairwells, and elevators on the first floor are blocked by security checkpoints. You need to scan your badge and your fingerprints to get through. It’s like something out of the Bourne trilogy. As a result, guests from outside of Massport have to be escorted through the building. Unless, of course, you’re Jason Bourne…but I haven’t seen him in East Boston yet. As the summer reaches its peak my colonies of honeybees continue their diligent work, building new comb, rearing new brood, and storing surplus honey for their upcoming winter. 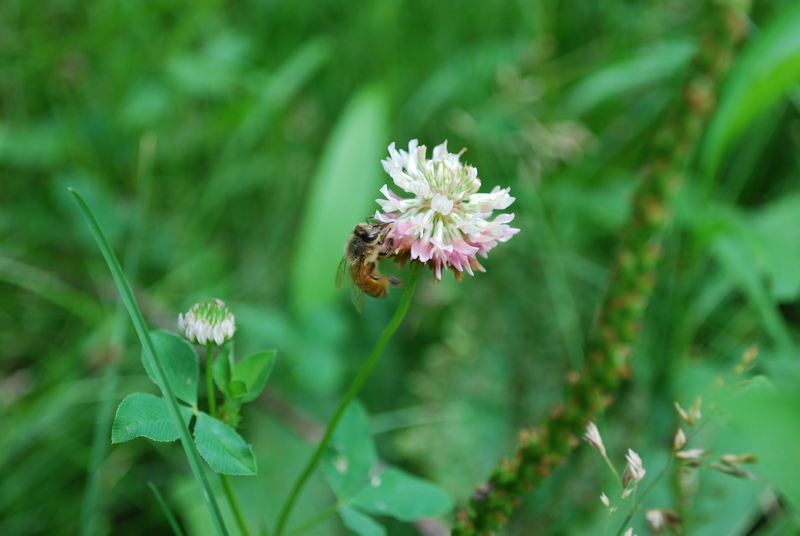 The warm New Hampshire days encourage them to not only continue consuming the sugar syrup in their hives but also to forage for pollen and nectar in the clover and wild flowers blooming around the hives. There was a set back in the last two weeks. Two of the three colonies had lost their precious queen. Having the initial inclination to allow these colonies to rear their own new queen I allowed them to start develop queen cells. 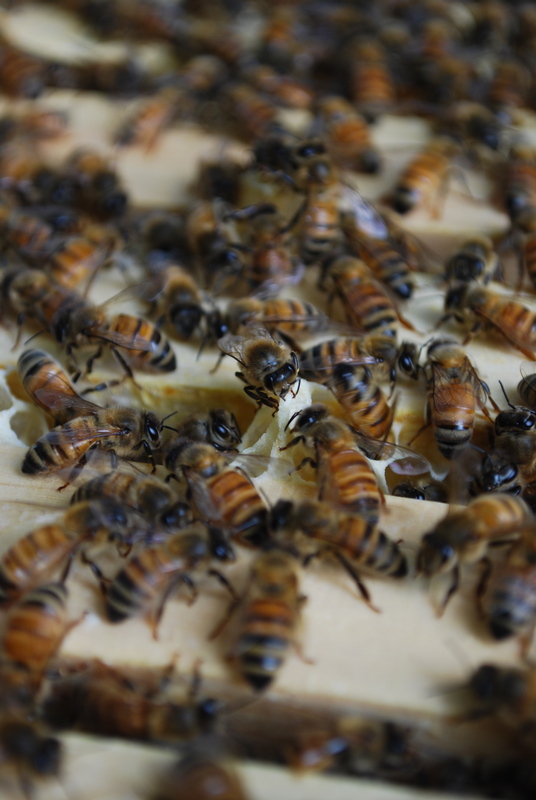 However, after speaking with Master Beekeeper Erin MacGregor-Forbes, I was encouraged to introduce a northern raised queen before the colony could finish creating their own. With this advice I visited Chris Rogers in Windham, ME (backwoodsbeefarm.com) and purchased two queens raised in Vermont. 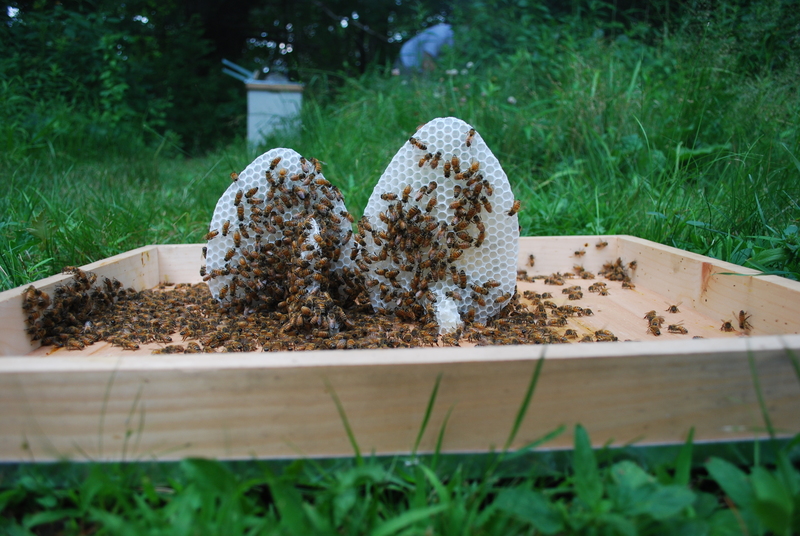 It is suggested that hives in the north east have a northern raised queen as she is more likely to be able to handle the drastic temperature changes than the southern raised queens that come with the original package of bees. The queen comes in a small wooden box with a screen over it. 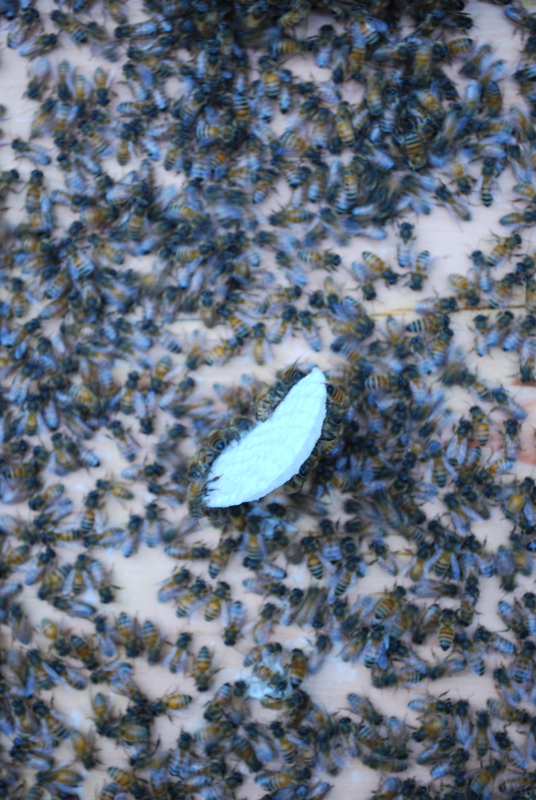 The white square at the end is made of sugar and serves both as a food source for the queen and her attendants as well as a wall to prevent her from being exposed to the colony too quickly. When the new queen is introduced to the colony she must stay inside her cage for a couple/few days to allow her scent to become familiar. If she is introduced too quickly, the colony will kill her. Before introducing these new queens the cells that were being built needed to be destroyed. 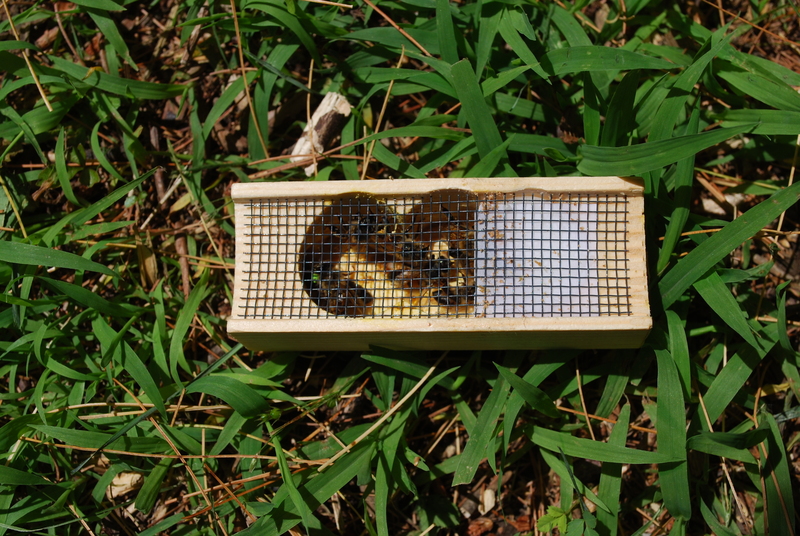 This is done so the colony has a higher likelihood of accepting the new queen. Queen cells are built on the bottom of the frames as they are irregular in shape, needing to be longer to accommodate her larger size. Removing these cells is quite intense as they have soft white larvae enclosed inside that burst and ooze white liquid when scraped from the frame. Killing infant queens is messy. 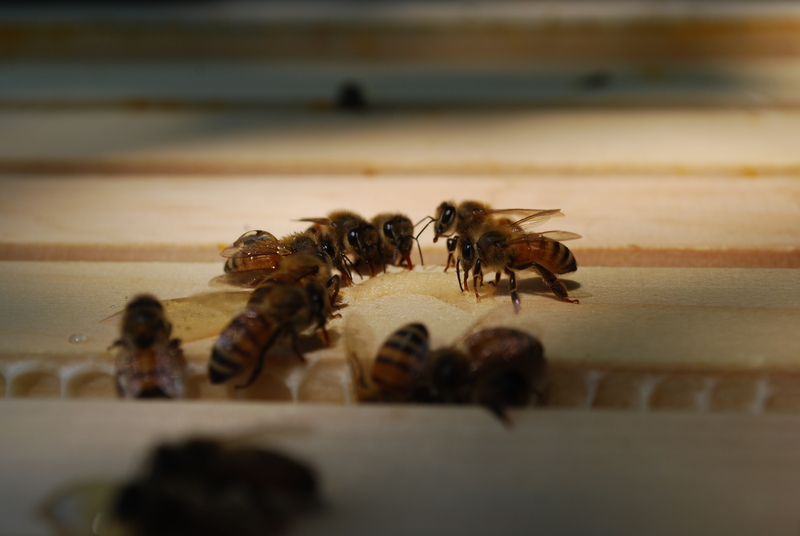 Of the fifteen or so queen cells that were destroyed in the removal process, I was able to save four from being ruined. I froze these four to allow for dissection. 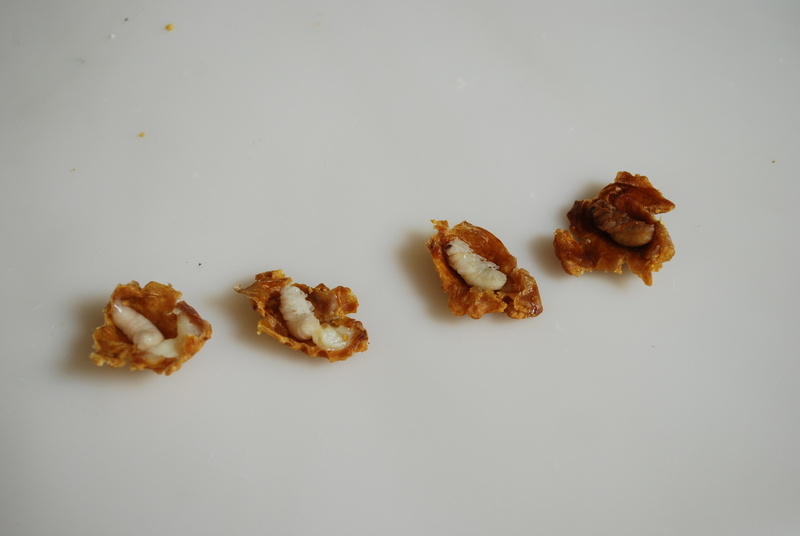 Opening these enclosed cells shows the metamorphosis the bees are undergoing from a larva to a mature honeybee. The northern queens are now out of their boxes and laying new generations of larvae with genes suited for our geographical location. The colony will build comb where ever there is space and needs to be inspected every couple days to prevent them from using energy building comb in undesired locations (like this one on the inside of the cover). My arrival in Delhi and Adhyayan takes place after most of the other fellows are half-way through their projects and its been really fascinating reading about their experiences while getting ready to start my own. My first fortnight at Zamrudpur has been quite an overwhelming experience, getting to know the neighborhood, its residents and the fantastic group of children studying at Adhyayan, who are the core group of individuals I will be working with over the next two months. These first two weeks I spent walking around the village, getting to know its streets and its residents, my personal mapping of its physical spaces and stories. 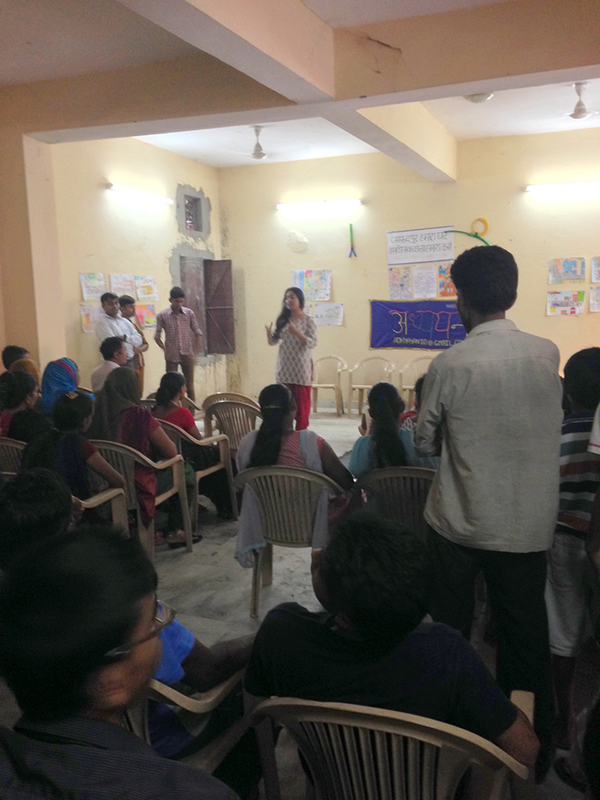 At the same times, I was introducing the concept of “mapping” to the children at Adhyayan, through a series of design charretts aimed as ice-breakers and to understand their feelings and hopes for their community and village. Each day we drew, sketched, wrote and narrated to each other on a variety of topics ranging from what was someone’s favorite spot in the village, how would we invite a friend to our house or give directions, what was our least favorite space on our walk home from school or a route that was avoided. Through these, we explored graphic representations of way-finding tools and a much deeper study of our everyday surroundings that we often oversee or ignore but in fact are extremely important stimuli for an outsider, unfamiliar with this space. 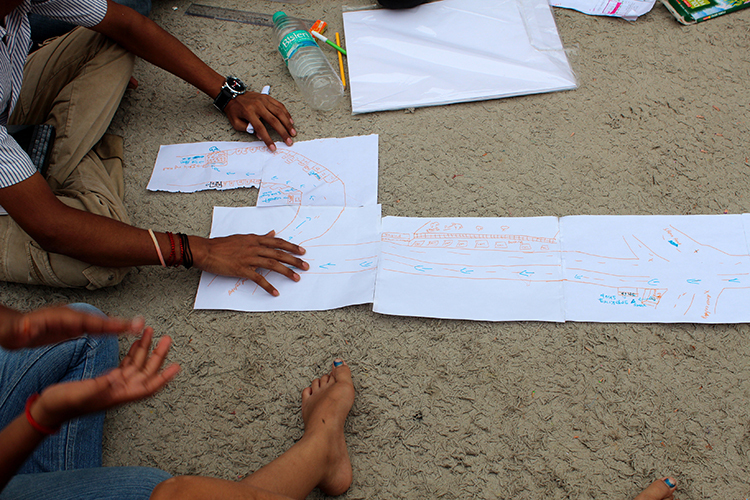 This concluded with the children creating directional maps to their own homes, which will be taken forward in the coming weeks to collectively map their whole neighborhood. One of the toughest and most important things I had to learn early itself, is that as a designer, conceiving and executing an idea individually might be a challenging enough experience, but it requires a completely different strategy to instigate and inspire someone not constantly immersed in design thinking to explore for themselves. A major problem that came to light through both the interactions with the children and my personal experience was the huge amount of garbage and trash in the streets, which was leading to un-navigable paths, clogging of drains and thus water logging during the ongoing monsoons and the general unfavorable conditions of a public space caused by sight, smell and flies induced by such waste. When this is factored to the community, which comprises mainly of low-income tenants, who find it easier to through trash out the windows of the houses they don’t own into a street that they don’t feel any ownership towards rather than walk a long distance to dispose of weekly garbage in the municipal dumpsters far away. But the solution to this is not merely a cleanliness drive, that the NGO and its students have engaged in, time after time, but the lack of ownership of common public spaces and the inaccessibility of a systematic garbage collection system for the community. Our steps going forward need to address this vital need of community ownership, making the public spaces and accesses usable by the community itself first.